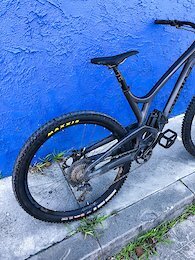 2018 SRAM Guide RS Brakes (Front & Rear) Used twice. Precut for a Large MTB - ready to install. No bleeding necessary. B1 / S4 with Bleeding Edge and Heat Shield Email with questions or inquiries. 2018 Fox Float X2 2-Pos 8.5 x 2.5 Recently Fox Factory rebuild. Works great. Used for 10 rides only. Email with questions or inquiries. 2017 Evil Wreckoning - Large $3150 Bike in very good shape. Some small scratches and wear on frame and components. Everything in working order. 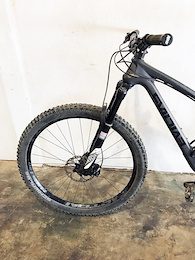 Shimano XT derailleur, cassette and shifter Shimano XT crankset BRAND NEW Raceface 30mm Aeffect R wheels BRAND NEW Maxxis Tires - DHF/DHF 3C EXO RS Reverb stealth 170mm dropper - just starting to get squishy but still working good 800mm Pro Tharsis 9.8 Bar (31.8 x 30mm rise) BRAND NEW Fabric Magic 50-01 Grips Pro Tharsis Stems (40mm & 50mm included to dial in sizing) BRAND NEW One Up Pedals Magura MT5 Brakes w/ new pads Lyrik RCT3 fork - clean stanchions Monarch Plus Debonair rear shock BRAND NEW WTB Team Silverado Saddle Email with questions or inquiries. Will consider selling frame & fork only. 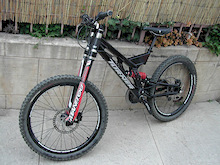 2005 Turner DHR Size: Medium Color: Black Fork: Manitou El Dorado Rear Shock: Romic Drivetrain: Shimano XT Wheels: Atomic Lab Brakes: Hayes Condition: Almost new, 15/20 days. Email or call with specific questions. Asking Price: $1,450 OBO Will box, and ship. Buyer pays cost of shipping.